Chris Hollands is TS’s Head of European Sales and Account Management and is responsible for all of TS’s client-facing activities in Europe, managing a team based in each of its office locations in London, Paris and Geneva. On a day-to-day basis, Chris oversees TS’s major broker relationships and buy side accounts in the region and supervises all sales and marketing initiatives. He rejoined TS in October 2016 following a two- year stint heading up Proposition Management for Equities at Thomson Reuters in Europe across its transactions, desktop and feeds businesses, and including its approach to MiFID II. 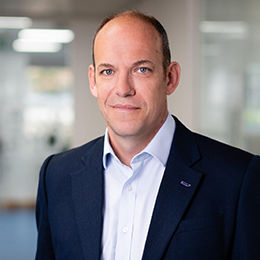 Chris originally started at TS in 2001 at the inception of its European operations to play a pivotal role in its evolution into a leading, multi- asset Execution Management System. Prior to joining TS, he worked in a buy-side business development role at the London Stock Exchange working at Fimat (now Newedge) sales trading equity derivatives.